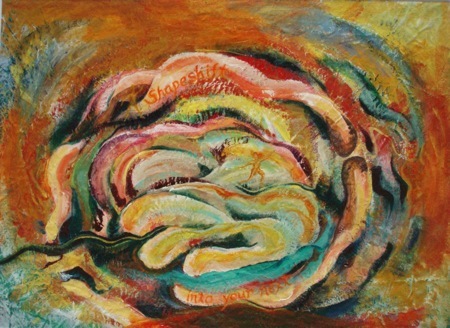 ©2010 Cherilyn SunRidge, Shapeshift Into Your Next. Acrylic, Poly-Vinyl, 19x26". Please visit my online gallery www.CherilynSunRidge.com to view this piece more clearly! ©2010 Cherilyn SunRidge, Be Essentially Informed. Acrylic, Poly-Vinyl, 25.5x39." I just viewed Jim Henson’s 1982 The Dark Crystal. It is a plethora of sound and visuals. This piece is shamanic and harmonic and karmic. Twenty-eight years later, the precepts stand, that when there is something aggravating outside of one’s essential bright self, the Way of transformation is to bring that force into your pure and light-filled heart, join with it/marry it, from that place of LIGHT. This is a wonderful alteration in perspective whereby no longer is anything viewed as “other,” but as unified. No sense of “self” is lost or surrendered, no uniqueness can be hazed or dissolved; we each continue to carry our one-of-a-kind vibration and the resonance becomes sweeter as we harmonize. We each are responsible for carrying The Light. We each are responsible for our vision. I am excited to bring the memory of this film into my studio, to carry its inspirations into my winter creations. I wonder what will occur?!?!? Within Who You Are, Who Are You? 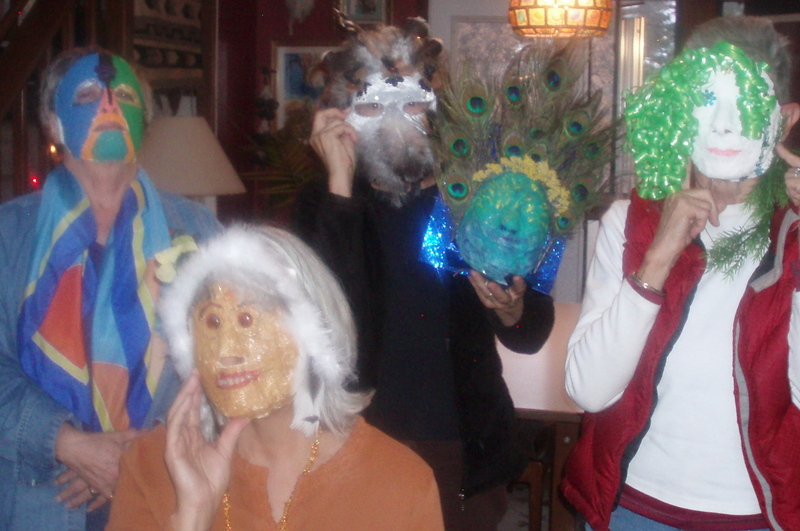 Our mask-making workshop was a deep preparation for winter time. We meditated and journeyed so as to go with Spirit while laying on the floor and being lovingly ministered to by our crafting partner. 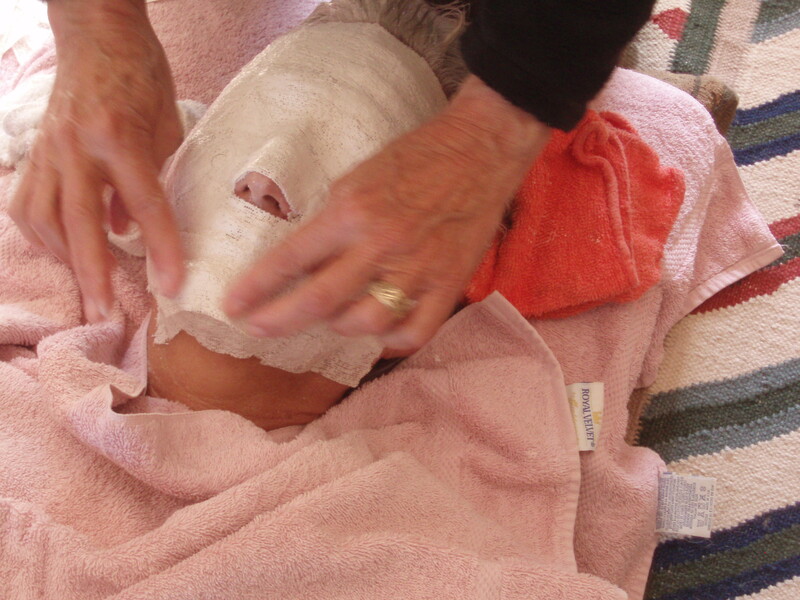 Each participant was gifted with a direction, given in her journeywork; some provocations were already in place from time leading up to the mask-making. We took our time to talk-story, to share the process of giving and receiving, to speak with our masks on at the end of our day. Even some having never put glue to paper, when it came time to embellish, there was a flurry of bright eyes and busy hands and a mission to bring out the final touches. It was a great day, rich and fun and deep and fulfilling. 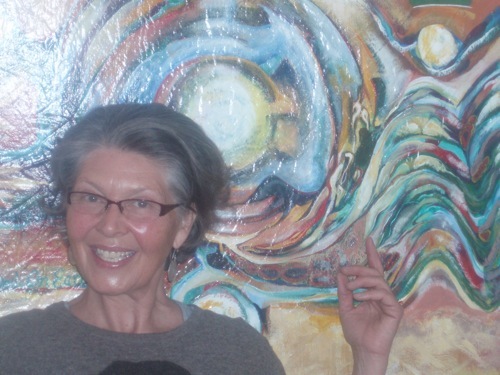 Last year I did a canvas of a mask, called “Within Who You Are, Who Are You.” As an artist, a presenter of ideas, I find the query stimulating on a regular basis! Recite several times a day for clarity! Please see this canvas in the floor canvases portfolio at www.CherilynSunRidge.com. Wishing you a bright-eyed stimulating day!